I’ve been wanting to learn more about Chicago history and so when I found Legend in the bargain bin a few months back I decided to pick it up. I’m not sure what I was expecting but I wasn’t particularly impressed with it. First of all, it was written by one of Richard J. Daley’s Press Secretaries, whose background was in reporting. He clearly didn’t know how to write a book-length story and so this book was cut up into tons of chapters, each only 2 or 3 pages long. There was absolutely no flow to it. It was not in chronological order and essentially repeated much of the information over and over again. I guess I was hoping it would give me a good background of Richard J. Daley, and move into some of the high and lowlights of his political career. Instead, it basically only touched on isolated events and showed examples of his political savviness. However, I did not need 10 chapters to serve as examples of the same point. Overall, I learned a few things but it really read like a series of newspaper clippings, most of which were covering the same few things. 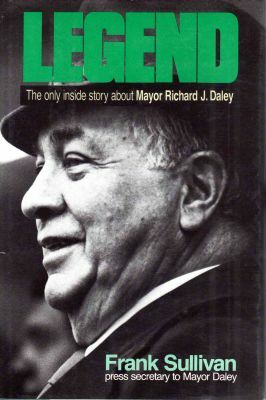 I would have liked a more cohesive, chronological narrative and more background on Mayor Richard J. Daley. This entry was posted in book reviews, non-fiction and tagged book review, non-fiction, sullivan. Bookmark the permalink.